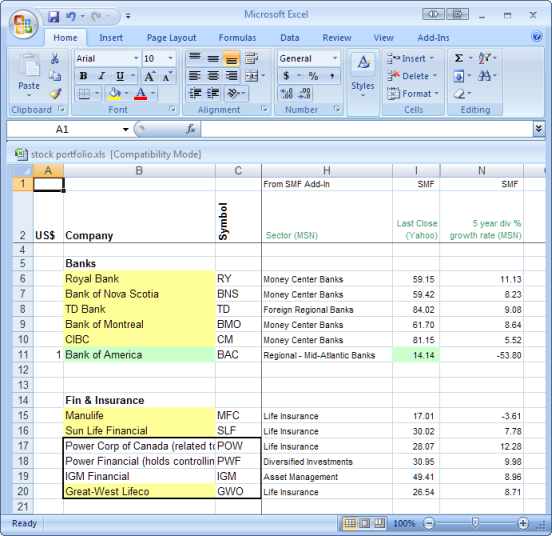 I used to track my portfolio using Excel. I did it this way for a year or so and there is nothing wrong with this approach but I eventually moved to using Quicken (more on that later). To get stock quotes right in the spreadsheet there are a couple of ways to do it. This is the method I used as it provided the most flexibility. An Add-In is basically just a file that you download and tell Excel about. After you do that, Excel will have extra functionality that it didn’t have before. In this case, the extra functions will allow you to pull in stock quotes and loads of other information off the web and into the cells of your Excel worksheet. In this case a fellow named Randy Harmelink was kind enough to create the SMF Add-In and provide it to people for free. The add-in is maintained at the website link below which is actually a Yahoo Group. To download the add-in and examples you need to register and join the group first (this will allow you to get to the Files area). Because this is a Yahoo Group, there are lots of posts by other users (like you). Chances are if you have a question it has already been asked and answered before. I used this only briefly before switching to the more powerful SMF Add-In. It provides the basics though and may already be installed on your computer so it may be worth looking at. The link I had to the Microsoft website seems to have expired and I read briefly that it may have been discontinued. You can still find it I'm sure if you dig a little, or perhaps they have replaced it with something newer. Here's a google search to get you started.